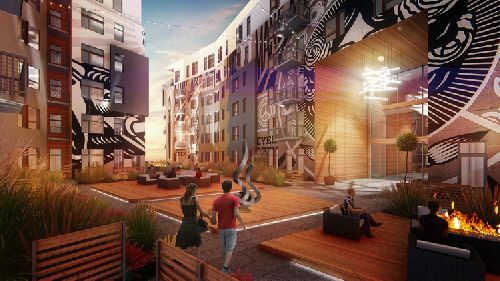 Mass Equities Inc and and AECOM Capital have teamed up for the development of a Class A, 522k sf mixed-use project in Denver’s emerging River North (RiNo) Art District. The development is slated to occupy a 7.8-acre site at 2900 Brighton that Santa Monica-based Mass Equities acquired in 2017. The transformation of this underutilized industrial property will be the largest to date in Denver’s rapidly evolving RiNo district submarket. The $200+ mil first phase of the project will include the repositioning of the existing 62k sf building located at 3060 Brighton Blvd into a state-of-the-art creative office building, taking advantage of the soaring and dramatic ceiling heights and open space already existing in the building. In addition, the initial plan is expected to include 480 apartment units, approximately 64k sf of new creative office space, and over 33k sf of much-needed retail space in the otherwise retail-starved RiNo area along Brighton. Led by Mass Equities Founder Drew Sobel and AECOM Capital Managing Director Ted Fentin, the RiNo development is the first joint MEQ and AECOM Capital project. AECOM will also serve as construction manager on the project through its AECOM Hunt business, in partnership with Denver-based Martines Palmeiro Construction (MPC). The value of the contract is expected to be included in AECOM’s backlog for its second quarter of fiscal year 2018.